macOS: What Is It and What's New? 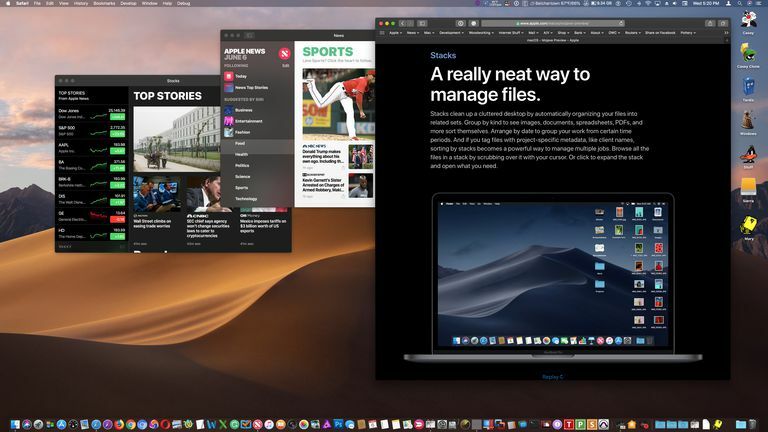 macOS Mojave using Dark Mode. macOS is the newest name of the Unix-based operating system that runs on Mac hardware, including desktop and portable models. And while the name is new, the features and capabilities of the Mac operating system have a long history, as you'll read here. The Macintosh started life using an operating system known simply as System, which produced versions ranging from System 1 to System 7. In 1996, the System was rebranded as Mac OS 8, with the final version, Mac OS 9, released in 1999. Apple needed a modern operating system to replace Mac OS 9 and take the Macintosh into the future, so in 2001, Apple released OS X 10.0; Cheetah, as it was affectionately known. OS X was a new OS, built on a Unix-like kernel, that brought modern preemptive multitasking, protected memory, and an operating system that could grow with the new technology that Apple was envisioning. In 2016, Apple changed the name of OS X to macOS, to better position the operating system's name with the rest of Apple's products (iOS, watchOS, and tvOS). Although the name changed, macOS retains its Unix roots, and its unique user interface and features. If you've been wondering about the history of the macOS, or when features were added or removed, read on to look back to 2001, when OS X Cheetah was introduced, and learn what each subsequent version of the operating system brought with it. Original release date: Announced at WWDC June 4, 2018; currently in beta; expected in late fall of 2018. Price: Free download (requires access to the Mac App Store). macOS Mojave gets its name from one of the deserts of Southern California. This is a bit of a departure for Mac operating system names, which had previously been inspired by the central Sierra Nevada mountain range. Dark Mode: Adds a new system-wide appearance option that changes the current Dock, menu bar, windows, and most UI elements to the dark side, or at least a dark gray in appearance. This is nothing new; apps have been using a dark theme for years, and Apple used a dark theme in its old Aperture image library application. There was even a dark UI option in the recent versions of macOS, but the effect was limited to the Dock and menu bar. With the new Dark Mode, you can carry the darkness throughout the system and most Apple apps. Third-party apps can also make use of the new UI, but aren’t required to do so. New Mac App Store: The Mac App Store hasn’t changed much since it was introduced with OS X Snow Leopard back in 2010. The new revisions to the store take their cue from the iOS App Store, which was revised in 2017. The new store provides easier to use categories designed to match up to how you use your Mac, a special Discover tool for finding hidden apps, and curated collections put together by Apple editors to assist in workflows of any type, including games. iOS Apps: Four popular iOS apps are making the transition to macOS: News, Stocks, Home, and Voice Memos. It was rumored that macOS would be able to run iOS apps, but that isn’t what’s happening here. These apps were recompiled, using new macOS APIs, as a showcase for developers that may want to redesign an iOS app for use with the Mac. It's a beginning, and it may point to some of the more popular iOS apps making their way to the Mac in the future. Dynamic Desktops: Desktops can now shift their appearance based on the time of day. The default Mojave sand dune images use the Dynamic Desktop feature to display sunrise over the dunes, shadows tracking the sun during the day, and sunset and a darkening sky in the evening. Desktop Stacks: Stacks have been a part of the Dock for a long time; now they’ve made their way to the desktop, where they can be used to automatically de-clutter your desktop by organizing files by type, date, tags, and various metadata items, such as project names or client names. Finder: The Finder gets some improvements, including a new metadata pane for viewing details about a file, Quick Actions that let you work on a file without opening it in an application, and Gallery View, which lets you scroll through file previews to find the one you’re looking for. Safari Privacy: Enhanced Tracking Protection built into Safari can thwart the creation of user fingerprints that are used to track your browsing on the web. Additionally, Intelligent Tracking Prevention keeps social media Like buttons, Share buttons, and comment widgets from being used to track you as well. Personal Privacy: Access to your image (camera) or your voice (microphone) must now be explicitly granted to any app that wishes to use these devices. Explicit permission is also required for any app that wishes to use message histories or the mail database. macOS High Sierra with About this Mac information displayed. screen shot courtesy of Coyote Moon, Inc.
macOS High Sierra's main goal was to improve the performance and stability of the macOS platform. But that didn't stop Apple from adding new features and improvements to the operating system. APFS: The Apple File System (APFS) actually isn’t new; it was first included in macOS Sierra. What makes its inclusion in macOS High Sierra an important feature is that now the APFS file system is the default; before this, it was just available as an alternative. Although APFS is now the norm, you can still make use of the older HFS+ file system, if you need to. HEVC: High Efficiency Video Encoding (HEVC) is a new compression standard that provides better quality compression compared to H.264, the default used in previous versions of the macOS. Metal 2: This new graphics technology provides Mac developers with near direct access to the Mac's graphics processing units. Removing the necessity to use intermediate programming layers to control the graphics should allow developers to radically improve performance of graphics-intensive applications. Metal 2 also allows the GPUs to be used for accelerated machine learning, opening up new capabilities to programmers and their apps. And if your current graphics card isn't up to snuff, Metal 2 supports external graphics cards connected via Thunderbolt 3. Safari: The default web browser, Safari sees new technology being introduced, including Intelligent Tracking Prevention to protect privacy and allow you to customize how privacy is enforced in general and site-by-site. Additionally, Safari gains the ability to block auto-playing videos, a great companion feature to its current ability to block auto-playing audio. Photos: Photos gets a number of new tools, including a persistent sidebar, editing of Live Photos, and a new Memory category for organizing your images. There's also improved facial recognition, new filters, and new editing tools for Curves and Selective Color. The default desktop for macOS Sierra. Screen shot courtesy of Coyote Moon, Inc.
macOS Sierra was the first of the macOS series of operating systems. The main purpose of the name change from OS X to macOS was to unite the Apple family of operating systems into a single naming convention: iOS, tvOS, watchOS, and now macOS. In addition to the name change, macOS Sierra brought with it a number of new features and updates to existing services. Siri: Siri may be old news to iOS users, but macOS Sierra is the first time Siri has graced the Mac. The intelligent assistant is available from the Dock and the Menu Bar, and also from a keyboard shortcut. With a little work by the user, Siri can also be made to respond directly to voice commands without having to first invoke the Siri app. APFS: Apple included a preview of the new Apple File System as part of macOS Sierra. APFS wasn't turned on by default, and there were no apps other than Terminal that could be used to interact with the new file system. As a result, few Mac users knew a new modern file system was available at their fingertips. Night Shift: Night Shift was added to macOS Sierra with the 10.12.4 release. It mimics the feature found in iOS that allows the display to increase blue light as the evening progresses. The increase in blue light, along with the corresponding reduction in yellow light, is believed to aid sleep. Optimized Storage: This new feature of the macOS allows you to use smaller drives but still have access to a large amount of data. In conjunction with iCloud Drive, Optimized Storage can move some of your local data to the cloud, allowing you to free up space on your drive. The moved data still appears to be present locally, but when you need the information, it's retrieved from your iCloud Drive. Tabs Everywhere: Apps that include support for multiple windows gain the benefit of those windows being available from a tab bar generated by the operating system. Disk Utility: This venerable app regains the ability to create and manage RAID arrays, a feature it lost in OS X El Capitan. The default desktop for OS X El Capitan. Screen shot courtesy of Coyote Moon, Inc. The last version of the Mac operating system to use the OS X nomenclature, El Capitan saw a number of improvements, as well as the removal of some features, leading to an outcry from many users. Split View: Split View brought an iOS feature - the ability to see two full-screen apps side by side - to the Mac. The Mac has supported full-screen apps since OS X Lion, but Split View brought new capabilities to the feature. Multi-Touch Gestures: While the operating system has supported multi-touch gestures since the introduction of the Magic Mouse and Magic Trackpad, El Capitan brought direct support for gestures to various apps, including Mail and Messages. Maps: The Maps app saw public transit information added to regional maps. Initial support was limited to major metropolitan centers, but additional transit maps were added with subsequent updates. Disk Utility: Disk Utility saw a major redesign of the user interface, resulting in the loss of many features, including the ability to create and support RAID arrays. Spotlight: The Spotlight search engine saw the addition of weather, stock, news, and sports scores as searchable items. System Integrity Protection: SIP (System Integrity Protection) was a new security feature incorporated into the OS. With SIP, most system files and processes could not be modified by other apps or systems, even if the user had root access. SIP is very effective at preventing system tampering, by malware or by accident. OS X Yosemite brought with it a major redesign of the user interface. While the basic functions of the interface remained the same, the look got a makeover, replacing the skeuomorph element philosophy of the original Mac, which made use of design cues that reflected the actual function of an item, with a flat graphic design that mimicked the user interface seen in iOS devices. In addition to changes to icons and menus, the use of blurred transparent window elements made their appearance. Lucida Grande, the default system font, was replaced with Helvetica Neue, and the Dock lost its 3D glass shelf appearance, replaced with a translucent 2D rectangle. Continuity and Handoff: Yosemite included the ability for the operating system to integrate with iOS 8 or later devices. With the use of Handoff, a service that used Bluetooth LE and Wi-Fi, users could use their Macs to place or answer phone calls through their iPhones, as well as use their iPhones to establish hotspots, allowing their Macs to connect to their iPhone's data plan. Continuity used the same technology to allow users to work in an app on one device, say an iPad, and then pick up right where they left off in the equivalent app on their Mac. Notifications Center: The Notifications Center added a new Today view that displayed timely updates, such as weather, stocks, and calendar events. Photos: Yosemite 10.10.3 saw iPhotos and Aperture replaced by the new Photos image management app. The original implementation of Photos lacked many of the features of iPhotos or Aperture that users had come to rely on, and was seen as a step back by many. Over time, new versions of Photos addressed many user concerns. Dark Mode: A new system preference that darkened the menu bar and Dock in keeping with the trend in many apps to use dark backgrounds. The Mavericks default desktop image is of a giant wave. Screen shot courtesy of Coyote Moon, Inc.
OS X Mavericks marked the end of naming the operating system after big cats; instead, Apple used California place names. Mavericks refers to one of the biggest large-wave surfing competitions held annually off the coast of California, near Pillar Point, outside the town of Half Moon Bay. Changes in Mavericks concentrated on reducing power consumption and extending battery life. Timer Coalescing: This technique reduced CPU usage by synchronizing tasks. This allowed the CPU to always have tasks to perform when awake, and allowed CPU sleep to occur for longer periods of time. The end result was less waking from sleep, quicker overall task performance, and reduced battery use because of longer CPU sleep times. App Nap: Before App Nap, some applications were running but not performing any useful activity; for example, waiting for user input could keep processors active, wasting power and generating heat for no real gain. App Nap could put individual apps to sleep when they weren't active, or if their windows and dialog boxes were hidden by other apps on the screen. Compressed Memory: Mavericks saw the introduction of a new memory management system that helped prevent disk paging, and made better use of available memory. The end effect was that Compressed Memory increased app performance by making better use of RAM space. It also had the side effect of requiring smaller amounts of RAM to perform tasks, making a Mac with a small amount of RAM installed perform like it had more than it actually did. iCloud Keychain: Allowed users to store passwords, user names, and other ID information safely in iCloud, and then use the information on any of their Apple devices. Maps: The Maps application was introduced to the Mac, mimicking the Maps app available on iOS devices. Finder: The Finder added a tabbed user interface, as well as a new tagging system to organize files. OS X Mountain Lion Installer. Screen shot courtesy of Coyote Moon, Inc. The last version of the operating system to be named after a big cat, OS X Mountain Lion continued the goal of uniting many Mac and iOS functions. To help bring the apps together, Mountain Lion renamed Address Book to Contacts, iCal to Calendar, and replaced iChat with Messages. Along with the app name changes, the new versions gained an easier system for syncing data between Apple devices. Notifications Center: New with Mountain Lion, the Notifications Center provided a unified method of receiving and organizing alerts issued by applications and web services. Notes: Once part of Mail, Notes was broken out as its own separate app; this matched the Notes implementation in iOS. Notes were synced across all of a user's Apple devices. Messages: The new Messages app replaced the well-regarded iChat app that was the default instant messaging app in previous generations of OS X. Messages supported Apple's iMessage protocol used in iOS devices, as well as XMPP (Jabber), AIM (AOL Instant Messaging), and OSCAR, as well as connections to Yahoo! Messenger and Google Talk. Game Center: Another new app making the crossover from iOS, Game Center allowed you to play against other Game Center players, keep track of scores and achievements, and follow a leader board for each game. AirPlay Mirroring: This new feature allowed the content of your display to appear on an Apple TV device on your local network. Lion was the first version of the Mac operating system available as a download from the Mac App Store, and required a Mac with a 64-bit Intel processor. This requirement meant that some of the first Intel Macs that used 32-bit Intel processors couldn't be updated to OS X Lion. In addition, Lion dropped support for Rosetta, an emulation layer that was part of early versions of OS X. Rosetta allowed applications written for PowerPC Macs (non-Intel) to run on Macs that used Intel processors. OS X Lion was also the first version of the Mac operating system to include elements from iOS; the convergence of OS X and iOS began with this release. One of Lion's goals was to start to create uniformity between the two OSes, so that a user could move between the two without any real training needs. To facilitate this, a number of new features and apps were added that mimicked how the iOS interface worked. Launchpad: This new application launcher looked and operated like the app launcher in iOS. Because Launchpad is an app, it didn't replace the existing Dock or Applications folder; instead, it just offered another method to start up applications. Scroll Bars: iOS uses a technique called natural scrolling, and OS X Lion incorporated it as the default scrolling method. For many Mac users, the result was very confusing, as the scrolling direction was reversed. Thankfully, the system preferences allowed you to select the method you wanted to use. In addition to natural scrolling, scroll bars also became invisible when not in use. This could also be changed in the system preferences. Auto Save and Versions: New with OS X Lion, Auto Save allowed apps to automatically save documents as you were working on them; Versions allowed you to access past revisions of a document. Address Space Layout Randomization: This security technique assigns system and app data to randomly selected locations in memory. This can help prevent malware from targeting a known location to inject itself into an app or service. File Vault 2: Updated File Vault to offer full disk encryption instead of just user space encryption. Snow Leopard was the last version of the OS offered on physical media (DVD). It's also the oldest version of the Mac operating system you can still purchase directly from the Apple Store ($19.99). Snow Leopard is thought of as the last native Mac operating system. After Snow Leopard, the operating system began incorporating bits and pieces of iOS to bring a more uniform platform to Apple mobile (iPhone) and desktop (Mac) systems. Snow Leopard is a 64-bit operating system, but it was also the last version of the OS that supported 32-bit processors, such as Intel's Core Solo and Core Duo lines that were used in the first Intel Macs. Snow Leopard was also the last version of OS X that can make use of a Rosetta emulator to run apps written for PowerPC Macs. Mac App Store: Snow Leopard was the first version of the OS to incorporate the Mac App Store for purchasing, downloading, installing, and updating Mac apps, including the Mac operating system. The Mac App Store was added with the release of 10.6.6. Finder: The Finder was completely rewritten in Cocoa to help improve overall performance and take advantage of new technology built into the operating system. Multi-Touch Support: Snow Leopard was the first version of the OS that included complete support for multi-touch natively. Earlier versions of Macs that had multi-touch trackpads were limited by the number of multi-touch gestures supported. OS Footprint: The Snow Leopard footprint was reduced to less than 7 GB of drive space. AppleTalk: An early networking protocol used by Apple that is no longer supported. Boot Camp: Boot Camp gained the ability to read and copy files from HFS+ volumes. Leopard was a major upgrade from Tiger, the previous version of OS X. According to Apple, it contained over 300 changes and improvements. Most of those changes, however, were to core technology that end users wouldn't see, although developers were able to make use of them. The launch of OS X Leopard was late, having originally been planned for a late 2006 release. The cause of the delay was believed to have been Apple diverting resources to the iPhone, which was shown to the public for the first time in January of 2007, and went on sale in June. Time Machine: One of the major new features in Leopard was the first inclusion of Time Machine, a then revolutionary backup application that was easy to set up and use, and even easier to find and restore individual files when needed. Boot Camp: Although users had already been messing around with ways to run Windows on the Mac's Intel-based hardware, Boot Camp was the first official method endorsed and even encouraged by Apple. Boot Camp provided tools for partitioning a Mac's startup drive to include a Windows volume, as well as the drivers needed to allow Windows to work with the Mac's hardware. Spaces: Allowed the creation of virtual desktops, each containing applications and windows used for specific tasks. You could create a space for working with emails and web browsing, another for gaming, and a third for productivity apps. You were only limited by how many "spaces" you could come up with. Quick Look: A built-in service that allowed documents to be quickly viewed without having to launch the applications that created them. User Interface Changes: Leopard included a number of minor user interface changes, including a 3D Dock and a transparent menu bar. The original multi-colored Apple icon in the menu bar was replaced with an all-black version. Application Signing: Leopard was the first version of the Mac operating system that used public key signing to ensure applications had not been tampered with, or that updates were indeed really the same app and not a piece of malware masquerading as one. The OS X Tiger retail box had no visual clue to the tiger name. Coyote Moon, Inc.
OS X Tiger was the version of the operating system in use when the first Intel Macs were released. The original version of Tiger only supported the older PowerPC processor-based Macs; a special version of Tiger (10.4.4) was included with the Intel Macs. This led to a bit of confusion among users, many of whom attempted to reinstall Tiger on their Intel iMacs only to find the original version wouldn't load. Likewise, PowerPC users who bought discounted versions of Tiger off the Internet found that what they were really getting was the Intel-specific version that had come with someone's Mac. The great Tiger confusion wasn't cleared up until OS X Leopard was released; it included universal binaries that could run on PowerPC or Intel Macs. Rosetta: This translation layer that was included with later versions of OS X Tiger allowed apps written for PowerPC processors to run on Intel Macs. Spotlight: This core search technology first appeared in Tiger, allowing Spotlight to be used to search all document types present on the Mac. Spotlight also introduced the concept of Smart Folders, special folders whose content was always updated based on search filters the user created. This allowed users to create Smart Folders that would contain, for example, all the documents they worked on in the last week. iChat AV: This addition to the iChat messaging system allowed up to four people to participate in a video conference. Automator: This scripting tool allowed users to link together apps and services that resided on their Macs, letting them create complex workflow automation with an easy-to-understand graphical interface. 64-bit User Space: Tiger supported both 32-bit and 64-bit processors. In addition, Tiger could support 64-bit userland addressing space, expanding the amount of memory that could be directly addressed. OS X Panther came in an almost all black box. Coyote Moon, Inc.
Panther continued the tradition of OS X releases offering noticeable performance improvements. This occurred as Apple developers continued to refine and enhance the code used in the still relatively new operating system. Panther also marked the first time OS X began dropping support for older Mac models, including the Beige G3 and Wall Street PowerBook G3. The models that were dropped all used Macintosh Toolbox ROM on the logic board. The Toolbox ROM contained code used to perform certain primitive processes that were used on the classic Mac architecture. More importantly, the ROM was used to control the boot process, a function that under Panther was now controlled by Open Firmware. Finder: The Finder made use of a new brushed-metal interface that included a new user customizable sidebar. Additionally, the Finder included direct support for zipping and unzipping files. Fast User Switching: This feature allowed a user to remain logged in while another user logged in and took control of the Mac. Exposé: A window manager that allowed all open windows to be shown as thumbnails, letting a user quickly switch between them. OS X Jaguar showed off its spots. Coyote Moon, Inc.
Jaguar was one of my favorite versions of OS X, although that may be mainly because of how Steve Jobs pronounced the name during its introduction: jag-u-waarrr. This was also the first version of OS X where the cat-based name was officially used. Before Jaguar, the cat names were publicly known, but Apple always referred to them in publications by the version number. OS X Jaguar included a hefty performance gain over the previous version. That's understandable as the OS X operating system was still being fine-tuned by developers. Jaguar also saw remarkable improvements in graphics performance, mostly because it included finely tuned drivers for the then-new ATI and NVIDIA series of AGP-based graphics cards. MPEG-4: Support for the MPEG-4 standard was built in to Jaguar via QuickTime. Address Book: This was the first appearance of Address Book for storing contact information. iTunes: Although iTunes was available for the Mac earlier, this was the first version of OS X that included the iTunes app. Inkwell: Inkwell provided native handwriting recognition. This technology was originally developed for the Newton OS, and the short-lived Newton personal digital assistant. Rendezvous: This networking protocol allowed devices on a local network to self-discover other devices, making networking setup mostly a plug-and-play process. Rendezvous was renamed to Bonjour in later versions of OS X.
Journaling: The HFS+ file system was updated with journaling support. Journaling increased reliability of the file system, and added data recovery features. Universal Access: This feature brought specialized access systems to the Mac to allow easier usage by individuals with various types of physical impairments. CUPS: The printing subsystem in OS X was upgraded to support CUPS (Common Unix Printing System). This allowed additional printer choices for Mac users, since easily available drivers could be used instead of custom ones designed for the Mac. SMB (Samba): Jaguar included support for Samba, an open source server that could work with Microsoft's SMB networking system. This allowed easy setup and use of file and printer sharing between Macs and Windows PCs. Happy Mac: Jaguar marked the end of the Happy Mac, a stylized splash screen showing a smiling face. In its place, Jaguar used a gray version of the Apple logo. The Puma retail box. Coyote Moon, Inc.
Puma was looked at mostly as a bug fix for the original OS X Cheetah that preceded it. Puma also provided some minor performance increases. Perhaps most telling was that the original release of Puma was not the default operating system for Macintosh computers; instead, the Mac booted up to Mac OS 9.x. Users could switch to OS X Puma, if they wished. It wasn't until OS X 10.1.2 that Apple set Puma as the default operating system for new Macs. Better CD and DVD support: The Finder and iTunes included direct support for working with CDs and DVDs; DVDs could be played back in the Apple DVD player app. Additional Printer Drivers: Apple claimed that OS X Puma had over 200 printer drivers available. Even so, printing was still an issue with the new OS X as few printer manufacturers were including support for it. New OpenGL Drivers: The new OpenGL drivers improved graphics performance, especially for 3D elements used in the user interface and applications. ColorSync: ColorSync brought color management to OS X, allowing users to fine-tune the color seen on displays and in printed materials. Image Capture: This standalone utility was added to Puma to allow images from digital cameras and scanners to be downloaded to the Mac without requiring a specialized app from third-party manufacturers. OS X Cheetah retail box did not play up the cat name. Coyote Moon, Inc.
Cheetah was the first official release of OS X, although there was an earlier public beta of OS X available. OS X was quite a change from the Mac OS that preceded Cheetah. It represented a brand-new operating system completely separate from the earlier OS that powered the original Macintosh. OS X was built on a Unix-like core made up of code developed by Apple, NeXTSTEP, BSD, and Mach. The kernel (technically a hybrid kernel) used Mach 3 and various elements of BSD, including the network stack and file system. Combined with the code from NeXTSTEP (owned by Apple) and Apple, the operating system was known as Darwin, and was released as open source software under the Apple Public Source License. Higher levels of the operating system, including the Cocoa and Carbon frameworks used by Apple developers to build apps and services, remained closed source. The Dock was an application launcher that was presented as a band along the bottom or sides of the display. Icons representing applications and documents could be placed (docked) in the Dock, making them easy to access and launch. Terminal: The Terminal app allowed access to the Darwin operating system using a standard command line interface. Until Terminal, the Mac OS was one of the few operating systems that did not have a command line interface available. Mail: OS X came with a built-in email client.Preemptive Multitasking: While the Mac OS was capable of multitasking, it used a cooperative system, with each app's tasks asking for, and hopefully being granted, use of system resources. Preemptive multitasking ensures access to the system when needed. Aqua UI: The new user interface was known as Aqua. During the rollout of Cheetah, Steve Jobs mentioned the three buttons on the top of most windows, claiming they had spent a great deal of time making them look so good that they were "lick-able." PDF Support: Applications were able to generate PDFs using the printing services built into OS X.
Quartz: Originally, Apple looked at using Display PostScript to drive the display graphics of OS X; the idea was based on how NeXTSTEP made use of Display PostScript in its products. Instead, Apple developed its own display rendering technology known as Quartz, which used PostScript to cache intermediate window graphics as PDF-rendered models. AppleScript: OS X included the AppleScript scripting language that had been included with the Mac since System 7 (Mac OS). Sherlock: A search system for finding data residing on the Mac or the web. Protected Memory: Applications are assigned memory segments that prevent an app that corrupts its own memory location from being able to cascade into other memory locations used by other apps and system services. What Is APFS and Does My Mac Support the New File System?